The U.S. Geological Survey (USGS) Earth Resources Observation and Science (EROS) Center has provided satellite imagery in the rehabilitation effort of Alabaugh Canyon following the most destructive fire in Black Hills recent history. The blaze, which was started by lightning began on Saturday, July 7, 2007, had been fully contained by Thursday, July 12, 2007, and burned 10,324 acres in southwestern South Dakota (near Hot Springs, S.D.). 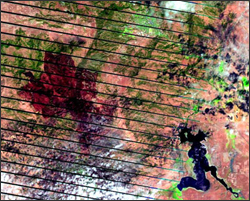 Imagery from the Landsat 7 and Advanced Spaceborne Thermal Emission and Reflection (ASTER) satellites are being used by emergency response personnel to map the burn severity within the fire perimeter. The emergency response team will use the burn severity and other information to devise plans that will mitigate potential post-fire hazards, such as landslides, and will aid in rehabilitation of the area. 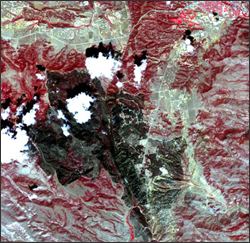 The Landsat 7 image (left) was acquired on Monday, July 16. The image has a 30-meter resolution. The fire scar appears deep red. Unburned ponderosa pine vegetation appears forest green, and unburned grasslands appear mauve. Angustora Lake is visible in the lower right corner of the image, while the city of Hot Springs appears at the top center. Some cloud cover (puffy white features) and associated cloud shadows (dark area offset from the white clouds) are also visible in the image. The Landsat 7 image also contains artifacts, which appear as black stripes due to the permanent failure of the Scan Line Corrector (SLC), which compensates for the forward motion of Landsat 7. The ASTER image (right) was acquired on Wednesday, July 18. The image has a resolution of 15 meters. In this image, the fire scar appears black. Unburned ponderosa pine vegetation appears red, while unburned grasslands appear grey-blue. The city of Hot Springs is visible in the upper right corner of the image. Some cloud cover and associated cloud shadows are also visible. This image was created using a band 3-2-1 combination. Due to the higher resolution of the ASTER image, the Highway 18 truck bypass through Hot Springs is visible at the top. Cascade Road (Highway 71) is also visible, along with several roads that provide access to various subdivisions in the area. ASTER data are provided by NASDA/SGFC/METI/ERSDAC/JAROS, and U.S./Japan ASTER Science Team and distributed by the Land Processes Distributed Active Archive Center (LP DAAC), located at the USGS EROS Center.